Aah, the narcissist… A deviously manipulative man capable of using his charming nature and sweet-tailored words to lure you inside his web and cunning you into thinking that he is the most wonderful man on Earth and that the love you two have is special and eternal. Yes, he can swipe you off your feet and turn your whole world upside down. But, his promises are short-lived just as his “love” for you. You were gullible enough to believe his story about his “crazy” ex and you even felt sorry for him, but now you know that she was a victim just like you. You finally saw the man behind the mask. 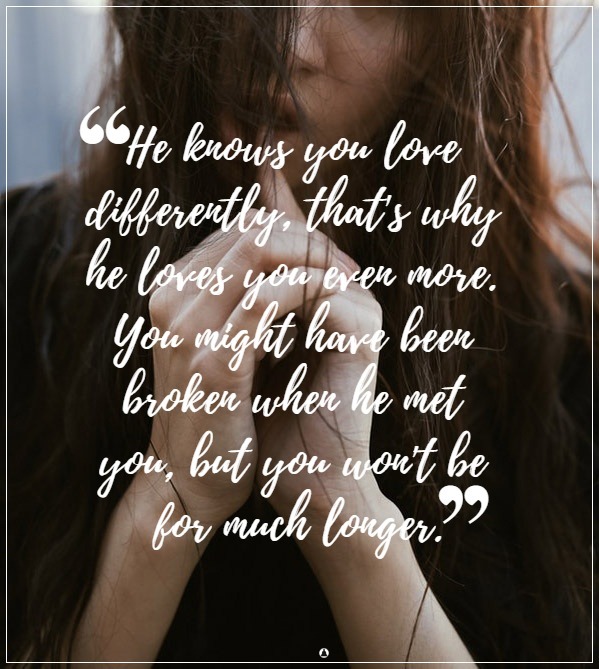 And even though you had untied yourself from him and escaped from his “magic,” the time that you’ve spent with him and the emotional trauma you’ve experienced left you with deep scars. It has also changed your whole perception about love while ruining your self-esteem. You are a free woman now and you love differently. Here are 8 ways how you show your love after you’ve been broken by a narcissist. In the relationship with the narcissist, you didn’t have a voice of your own. He held the pen with which he was writing your love story, and even though you often hated the story – you couldn’t do anything about it. You didn’t trust him. You were afraid that he was going to leave you. Therefore, now, you have trouble trusting someone new. You need an honest man that will make you believe in love again. A genuine man who is true to his words and puts them into action. Someone who will understand you when you are doing inconsiderate things out of fear and will be there for you and help you overcome all your fears. Your narcissist made you feel guilty about everything that was happening in the relationship. You found yourself constantly apologizing for everything that was wrong even though it wasn’t your fault. You were so insecure in your previous relationship with the narcissist that you now need a constant reassurance of your partner’s love for you in order to feel safe and calm. You need him to tell you that he loves you and he’ll be there for you. You need him to be your safe place. Your companion. Your support. Your best friend. You are unknowingly destroying your happiness. You are sabotaging your new relationship because of the emotional traumas from your past. The relationship with the narcissist broke you and now you can’t see and appreciate all the good things that someone else is doing for you. You can’t believe their intentions because the narcissist was also perfect and was doing everything perfectly at the beginning of your relationship only to destroy you in the end. You don’t want that to happen again. Perhaps the narcissist has given you a little taste of what love should be like at the beginning of your relationship, but it left you with a bitter taste in the mouth. And now that you have a good man by your side, you don’t know how to behave around him. The love that he offers is unknown to you, so you are afraid that everything will turn out to be just a big charade. Therefore, you will need some time to relax and accept the love that you deserved from the beginning. The narcissist has hurt you so bad that you need time to heal and let go of the pain before you can trust anyone again. Until then, you’ll keep your walls up high and your emotions low. Because you don’t want to be hurt again. You don’t want another heartache. Don’t worry. This will pass, and you will start expressing your deep emotions freely when you meet someone who is worthy of your love and affection. With the narcissist you were always on the edge, unsure about his next move. One day he was all loving only to leave you alone and hurting the next. Therefore, it is no wonder that you will have doubts and insecurities about your partner’s feelings in your next relationship. You worry that they will stop loving you. You worry they’ll leave you. So, you are always guessing and obsessing about the relationship. Guess what? With the right man, there won’t be any. Yes, you might be insecure because of the emotional turmoil and rollercoasters of highs and lows that you’ve experienced with the narcissist. However, when you are with a true gentleman who really loves you, there won’t be any tornados or tsunamis. Everything will be smooth and easy. You will see only calm seas and clear skies on the horizon. Don’t worry. You are not alone. There are many victims of narcissists out there who managed to survive the relationship and are now strong than ever. Everything you feel is normal and a part of the healing process. Just give yourself time and with the right man, you’ll start feeling like yourself again. Image: C h l o e .